I just tried this plugin and I really love it!! Although it need Java I WANT this to see in LibreOffice!!!! LanguageTool Style and Grammar Checker. You can see it LibreOffice, you can install it as an extension any time. 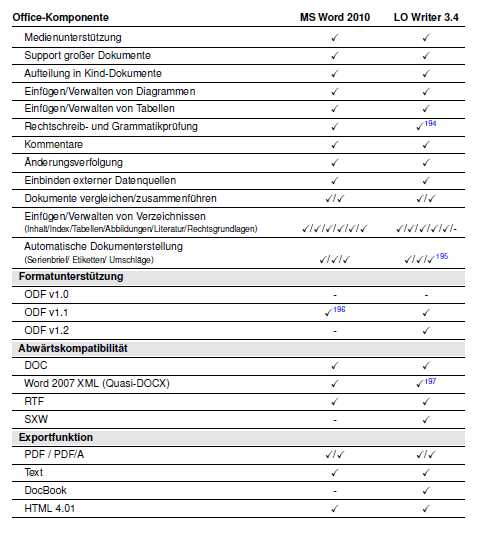 I hope you did not mean that LibreOffice should ship it by default. 😉 It slows down startup (a Java VM needs to be started) and a minority of users needs grammar checker at all. LibreOffice has a built in lightweight grammar checking solution, Lightproof. Unfortunately it does not support as many languages as LanguageTool, but hopefully the situation will change over time. You can see it LibreOffice, you can install it as an extension any time. I hope you did not mean that LibreOffice should ship it by default. It slows down startup (a Java VM needs to be started) and a minority of users needs grammar checker at all. LibreOffice has a built in lightweight grammar checking solution, Lightproof. Unfortunately it does not support as many languages as LanguageTool, but hopefully the situation will change over time. There is a point “Rechtschreib- und Grammatikprüfung”… It is checked, but there is a note (number 194; My translation: 194: With a plugin) And this very plugin is Language Tool. If ANYONE has to make a decision, it is not good to have a image like this: ” When I am using LibreOffice, I have to find solutions for *anything*. There is not a properly working spell checke included for my language. I will spend a few bucks and buy MS Office. It is nowadays the standard tool AND has a well working spellchecker included…” ( Some imaginary thoughts of a responsible person). IMHO it is a _NO GO_ not to include a proper spell checker… We should have a talk with them… Maybe they will include their plugin to LibreOffice and (another maybe) they will rework it using C++…. ALL in all: We need a better spell check to get a better rating from the BRD… With the current report, I don’t think we will win any new user….